Are you looking for a way to run Play 2 Framework on Maven with its auto-reloading functionality? You've come to the right place, read on. I've been working with Play2 Framework for several years now and it's a very nice way to develop in Scala. Some of the Play projects have grown rather large and have become sluggish in combination with SBT. Resolving dependencies, compiling and starting Play all take a long time with SBT. Perhaps my biggest objection is that SBT can not stage a self-contained integration-test environment. These shortcomings have forced me to look at SBT alternatives. I arrived at a way to build and run Play projects with support for auto-reloading using Maven, play2-maven-plugin, sbt-compiler-maven-plugin, Eclipse, DCEVM and Zinc. This article describes how to set up such an environment for your own enjoyment. Which version of Scala IDE, Eclipse, Zinc or Maven you install should not matter much. However, the Java and DCEVM versions do matter. It is paramount that the build versions of both Java and DCEVM (in this case 7u51) match perfectly and that you get a full version of DCEVM. This will open a GUI which asks you to specify the Java home directory for Java 7u51. If it's not already there, click the "Add installation directory..." and browse to the right Java home directory (look this up for your own operating system, this may be different). 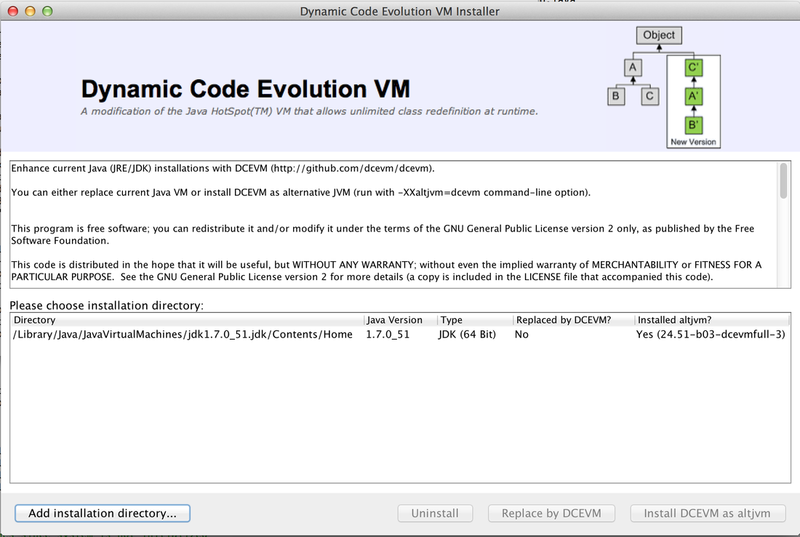 Then select the right Directory for Java version 1.7.0_51 and click "Install DCEVM as altjvm". Apache Maven, Scala IDE and Zinc are all available to download as binaries. Download and extract the binary the respective binary archives and you should be good to go. Special note on running Maven: you have to set the JAVA_HOME environment variable. This is explained on the Maven download page (scroll down) for each operating system. The JAVA_HOME environment variable should be set to the same path you selected in the DCEVM GUI. Start up the Scala IDE (run the file called `eclipse` in the extracted directory) and import this example Play2 Maven Hotreload project into Eclipse. Then enable the "eclipse" build profile by right-clicking on the "play2-maven-hotreload" project and go to Maven > Select Maven Profiles. Make sure only "eclipse" is checked and click OK. Right click the project again and go to Configure > Add Scala nature. The eclipse project is now set up correctly. Note: at the time of writing the current play2-maven-plugin release does not have Dev mode support yet and as a result the static resources are cached by the browser in Prod mode. Grab this modified version of the play2-maven-plugin to build a snapshot that supports Play in Dev mode. I imagine this will also work with other IDEs that have hotswapping support, like Netbrains IntelliJ IDEA, but I have not tried others so far. If you have tried, please drop your experience in the comments below. Grzegorz Slowikowski, the author of play2-maven-plugin, has brought to my attention that LinkedIn is planning to bring hot-reload support for Play 2 to Gradle. 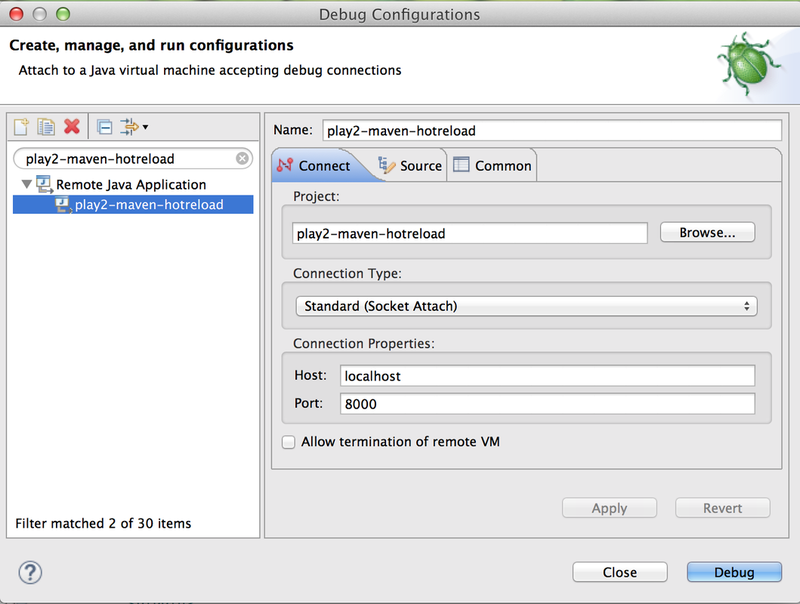 Somewhere in the future the play2-maven-plugin will support hot-reloading natively as well, until that time it will remain in beta. Simpler and more portable alternatives to SBT are on the way, stay tuned. Thanks for reading. If you are trying to get some test scripts running on Ubuntu 12.10 and you can't get the Intel SDK to work, here's a handy tip. Go over to the AMD website and download their AMD APP SDK. As long as your CPU supports SSE, the AMD SDK will provide you with OpenCL capabilities on any processor. I was having trouble getting Intel's SDK to work, as well as their open source variant Beignet. Both versions did not reckognize any OpenCL platforms or devices. I am on a Intel Core I5 CPU with Intel HD Graphics 4000 (it's a shame I can't use that on Ubuntu yet, though I am happy to be running sample code now :-)). As a final step reboot your computer and then you should be able to run OpenCL applications on Ubuntu. Update August 19th, 2013: updated AMD APP SDK download links from version 2.8 to version 2.8.1.0 and updated recommended download method, thanks to Jacek for pointing that out! Recently I noticed some emails sent by Magento keep bouncing back. The mail server dropped me a few "Undelivered Mail Returned to Sender" messages. This is very undesirable, since this means that some order confirmations and/or invoices are not being delivered to the customer. After some investigation I discovered a Magento setting under System > Configuration > Advanced > System > Mail Sending Settings > "Set Return-Path". Set this value to "Yes" to make the Return-Path the same as the sender. Alternatively, you can set it to "Specified" and specify a "Return-Path Email" where all bounced emails get sent to. This can come in handy if you want to have those emails checked with priority for example, you could sent bounced mails to a priority mailbox instead. Not specifying a Return-Path in Magento (ie. setting "Set Return-Path" to "No") will most likely get your emails blocked by a lot of spam filters. This tutorial describes how to set up database replication for MySQL using SSL on Ubuntu 12.04. There are some tutorials out there, but I found out they are a little outdated and don't work as well any more (at least not for Ubuntu specifically). So I decided to write down my experience for other developers who find them selves setting up MySQL database replication to make their lives easier. First, we start with setting up the master server. Last, we set up the slave server to download database changes from the master server. For the purpose of this tutorial we are going to replicate a database called 'exampledb' from a server at master.webdevelopersdiary.com to a server at slave.webdevelopersdiary.com. Set up database replication privileges (and force SSL). Perform initial database backup to start replication from. The line starting with “bind-address” should be commented out if present. Next, we create a database dump of the database we want to replicate (exampledb). During the dump, we need to lock the database to determine the exact position from which we need to start replicating (corresponding to the database dump). So we write down the log ‘position’ column from which to start replicating on the slave. Copy exampledb.sql, ca-cert.pem, client-cert.pem and client-key.pem from the ~/mysql-tutorial/ directory to the slave server located at slave.webdevelopersdiary.com. Convince yourself there is no firewall running that is blocking SQL connections from the outside. That's it for the master server. Edit MySQL server configuration my.cnf. Configure and start slave server. Execute following SQL to import database and start slave. Make sure you replace the correct values at MASTER_HOST, MASTER_USER, MASTER_PASSWORD, MASTER_LOG_FILE (from earlier written down value) and MASTER_LOG_POS (also from earlier written down value). That's it, database replication should be up and running! Bonus tip: you can always find a recent version of the Quercus WAR file at http://www.caucho.com/download/quercus-4.0.x.war, replacing 'x' with the latest version, e.g. http://www.caucho.com/download/quercus-4.0.28.war. You can find the latest version number by looking at Caucho Resin's version number on the website's download page. I figured this out once by guessing URLs to download the latest version. The Quercus website is not updated frequently enough to keep up with newer releases, but the files are actually there. I had to do these steps in order to test a fix I am preparing for H2 to solve the "SET NAMES" syntax error in MySQL compatibility mode when connecting to H2 using the Quercus PHP MySQL driver. SQLite is a popular choice for PHP programmers to kick-start their development. It's easy, self-contained, requires no configuration, no server and all the data is kept neatly in just one file. Then later on, the application is commonly migrated to a production DBMS (e.g. MySQL). There have not been any alternatives for SQLite when developing in PHP with MySQL as a target platform. But then again, why would you want an alternative for SQLite? Well, to name a few reasons: MySQL compatibility and support for hash indices. And that's not all! Keep reading to see why. When looking for alternatives to SQLite, I came across two suitable candidates: H2 database engine and a MySQL embedded version. My criteria were that the alternative should be as easy to use as SQLite and compatible with MySQL, based on two reasons. First, I wanted it to be compatible with MySQL so that I can keep using that easy self-contained database for development even after the application has gone into production. Second, an easy to setup database is great for bringing new developers up to speed with development as fast as possible. Let's start with the good stuff. Below is a comparison of SQLite, H2 database engine and MySQL embedded version. Comparison of self-contained PHP development databases. To me it looks like H2 database is the easiest to manage. It requires no server and everything is put neatly in one file, which makes back-upping and sharing databases among developers easier. It even has a nice extra feature over MySQL: encryption of data files (though I don't see a direct need for that during development for me personally). I have experimented with PHP and H2 before and ran into some limitations (Quercus' MySQL driver doesn't play well yet with H2's MySQL compatibility mode so I have to use the Quercus' PDO driver instead). I haven't tried embedding MySQL yet, which is what I am going to try next. The embedded version of MySQL has the big benefit of being 100% MySQL compatible, but it also has an uncertainty. I am not sure if it's okay to redistribute my application (containing embedded MySQL) among developers. Another limitation could be that I would have to buy a commercial license for MySQL should I choose to distribute embedded MySQL to customers (vs. customers setting up their own MySQL server). Though, it is okay to use MySQL embedded version for a website hosted by myself (it's not technically distributed in that case). For now, I have not decided yet whether I will stick with H2 or switch to the embedded version of MySQL. I am going to give both a try and I will keep you updated via this blog! Recently I was experimenting with running PHP and the H2 database engine in a Java web server using Caucho Quercus (or just Quercus for short). In theory this would yield an ultra portable platform-independent PHP, web server and database stack. I eventually got it working, but with some limitations. Before I get into details, here are some quick notes: Quercus is a 100% Java implementation of PHP5, though it doesn't support 100% of PHP5's functionality, unfortunately. Also, Quercus' implementation seems to differ from PHP5's implementation sometimes. That said, I thought I would give it a shot anyway, because some popular CMS systems have had success running with Quercus, such as Drupal and Wordpress. I used Jetty as my Java web server (a.k.a. Java web container) and Maven for dependency management. The source code of my experiment is available at github. This tutorial describes how to set up the PHP and database stack in the Jetty web server. First we set up a web application (webapp for short) in Java which can interpret .php files using Quercus. Then we setup the H2 database engine. Last, we setup the part where PHP can connect to H2 while actually thinking it is MySQL that it's connecting to (using H2's MySQL compatibility mode, because PHP does not have support for H2). Here we go! Download latest version of Quercus (scroll down, get the WAR file). Connect to the database in your code using "$pdo = new PDO('mysql:');", mysql_connect() doesn't work due to a driver incompatibility, for more information on this keep on reading. Congratulations! If you made it this far, you have successfully setup a Java web server that can interpret PHP files! But, we're not there yet, we still have to add database support. To actually integrate H2 and PHP we need to tell Jetty some additional configuration. Get these two files (web.xml and jetty-env.xml) and drop them in your src/main/webapp/WEB-INF/ directory (create this directory if it doesn't exist). Go to http://localhost:8080/test-database.php to see if it's working (which if everything went okay, it should!). I would like to see a working version of Code Igniter using the ActiveRecord class running on this stack. Also, it would be nice to have H2's MySQL compatibility mode compatible with Quercus' MySQL driver, so we can run applications that use mysql_connect() on the stack (e.g. phpMyAdmin). If you want to call PDOStatement::fetchObject(), you should call PDOStatement::fetchObject('stdClass') instead. This is a bug in Quercus (remember I said in the beginning that sometimes Quercus' implementation differs from PHP's). Acccording to the PHP Manual, the default first argument for PDOStatement::fetchObject should be 'stdClass', it seems the folks at Caucho forgot to implement this. Where you replace 'filename' with a relative path to a file (relative to pom.xml) or an absolute path to a file. Note that "mem:" has an extra ":" after it and "filename" does not. For more information about the H2 JDBC URL see H2's feature list. timestamp can hold values only in the range '1970-01-01 00:00:01' UTC to '2038-01-19 03:14:07' UTC while datetime can hold any value in the range '1000-01-01 00:00:00' to '9999-12-31 23:59:59'. timestamp is the only mysql field type that stores values relative to a timezone (namely UTC), datetime does not store according to a time zone! Some countries have daylight savings time, if your server is configured to that country's particular timezone, your server automatically changes time zone upon entering and leaving daylight savings time. A bug in the system software changes the time zone by accident. To stick with the daylight savings example, let's say the clock gets rewound one hour. Transactions are still happily being inserted into the database using datetime. Now, according to the transaction log, customers are making twice the amount of transactions during this hour. But wait?! Weren't we keeping an eye on the maximum amount of transactions per hour of clients? It looks like some clients that are operating at only half of their capacity suddenly exceed the maximum transaction limit during that hour, uh oh! Alternatively, you could store unix timestamps in unsigned int columns. But then you can not reliably use all those useful documented MySQL date and time functions, and, you would have to write your own date and time calculations using math in queries which can get messy. A disadvantage of storing all values in a datetime field is that you cannot make use anymore of the CURRENT_TIMESTAMP default value. But then again, if you need to store values outside the timestamp range or need 100% reliability, that might be one of your lesser concerns. Use UTC formatted date and time values within MySQL and your application for reliability . Store all your date and time values in UTC format in a datetime column.